FREE Samples: Mazama Hardwood - Smooth South American Collection Natural / Cumaru / Premiere / 3 3/4"
Natural / Cumaru / Premiere / 3 3/4"
Add a rich and exotic design element to your home with the Mazama Hardwood Smooth South American Collection. 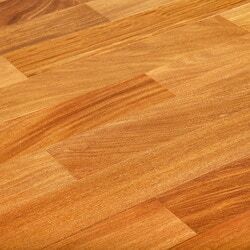 Made from naturally durable Cumaru wood (also known as Brazilian teak), this incredibly hard exotic hardwood offers superior durability and strength that you can count on. This premium solid hardwood flooring will give your space a sense of warmth and timeless beauty. With BuildDirect’s manufacturer-direct prices, you can achieve this all for less. Learn more about this stunning hardwood flooring below. Dynamic, natural beauty: offering rich golden brown, to deeper reddish tones, Cumaru has distinctive grain accents dispersed throughout the wood. Known for its unique patterns and one of a kind appearance, Cumaru’s subtle beauty is eye-catching. Premiere grade flooring: offering the best floor boards available, this premiere grade flooring is carefully chosen for its overall appearance, color consistency, and better than average lengths. Expertly milled: crafted for tight fitting installations, these hardwood planks have fine cut edges that lock together smoothly and offer a consistent thickness amongst each plank. Install these boards using a nail down method. Extremely durable: with a Janka hardness rating of 3540, Cumaru is nearly twice as hard as domestic species like Northern Red Oak. This makes Cumaru better able to withstand heavy foot traffic, scratches, and dents. Finishing touch: for lasting protection and enhanced scratch resistance, this premium prefinished hardwood has 7 coats of Treffert Aluminum Oxide Finish. Post purchase support: Mazama is so confident in the quality of this hardwood, they offer a 25-year finish warranty and a lifetime structural warranty. Plank dimensions: these boards measure 3/4" Thick x 3 3/4” Wide x Random Lengths (average length 30”, maximum length 72”, minimum length 12"). Hardwood - Andes Collection - Natural / Cumaru / Premiere / 5"
The wood and finish are beautiful. The quality of machining is poor. In every box there was at least one piece that was up to an 1/8 inch narrower then the rest and several had a taper from end to end. It was very difficult to avoid gaps between courses. The quality control of this Peruvian product is not up to the standard of the American flooring I have used before. This would looks like the picture and is absolutely beautiful. We had bought and installed this beautiful product in our downstairs a few years ago. It's now time to do the upstairs and the product was the same excellent value for the price. Arrived quicker than we needed, but gives it time to acclimate to our home. We will be using the same installer and he was happy we are ordering the same product from the same company. He was VERY impressed by the quality of the product last time. I'm excited to see the completed project as I love this wood on our main floor. The flooring is stunning. A bit more variety in the colors than I had expected but the variations only add to the richness.